Supervising and control water flow over the geographically distributed area is important to prevent fluid loss and disaster for fiscal and safety reasons. However remote locations are difficult to monitor due to the lack of social infrastructure such as power or network. 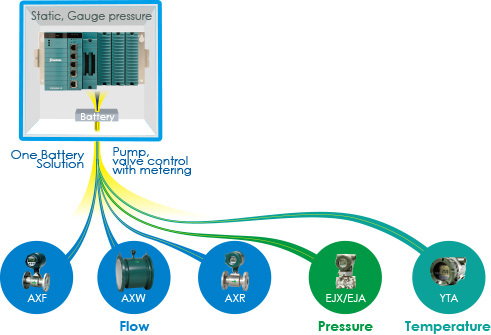 Yokogawa's low power solution offers the best performance for control and monitoring variety of water applications. Solar batteries and panels dominate the installation cost. 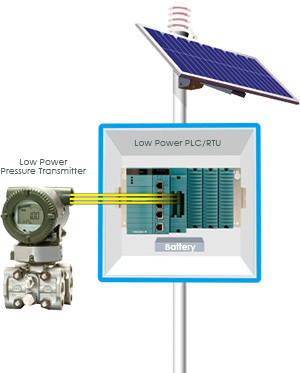 Yokogawa's low power solution is bestpractive for solar battery systems, even thriving under extreme ambient temperatures, from -40 deg C to 70 deg C. It's super low power enables solar panel and battery size to be kept to a minimum and it is adequate for a wide range of power to handle unstable power sources. Furthermore, even if the solar power drops out of this range, FCN-RTU can detect it. Running costs for monitoring and maintaining remote utilities can't be overlooked. DNP3 embedded in FCN-RTU contributes to the reduction of running costs by sending site information using the least amount of packets over mobile networks. Also the number of site visits required to recalibrate transmitters is reduced thanks to Yokogawa's uniquesilicon realizes sensor technology which realizes high measurement accuracy and long stability. Usability is non-negotiable for maintenance at site. Basic transmitter settings do not require a PC but can be done on the transmitters and the modification of applications on FCN-RTU requiring engineering knowledge can be done from a central location without interrupting control. Yokogawa's range of flow meter instruments include vortex, magnetic, variable area, Coriolis, and differential pressure flow meters.